Thoughtfully designed to scoop out can corners. 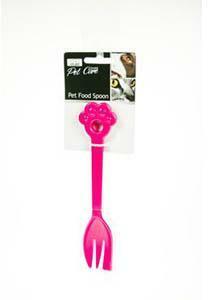 The Cat Food Fork is the simple way to keep a dog's food server away from other kitchen utensils. Its fun design is easy to recognise, so it can be washed and stored separately for extra hygiene. Made from strong, easy-to-clean, non-toxic plastic material.